A growing collective of designers, scientists and engineers turn to nature today–seeking a blueprint for both new development and keys to problem-solving for existing, human-made challenges. This emulation and inspiration can be in three formats–mimicking natural forms and physical features in our own products, or replicating natural processes and metabolisms, or finally taking clues for our cities and systems from the organization of ecosystems and ‘Super-organisms’ that successfully adapt and thrive in today's shifting landscape. In this definition, the easiest concept for us to identify with, as designers, is the emulation of nature’s time-tested patterns. After all, for centuries, designers and artists have attempted to capture and replicate the beauty and complexity of natural patterns through imagery, form, and texture in their products. Today, Textile and Surface Designer Abigail Jennifer joins this movement, but with a distinctly Biomimetic approach, that draws from a very specific landscape, and results in her ‘Mineral Collection’ of materials and 3D forms. The Mineral Collection of materials, surfaces and 3D forms, by Abigail Jennifer. The vividly colored, translucent, textured and opaque forms in this collection are an abstraction and material interpretation of elements such as rocks, channels, streams, and distortions of both natural and man-made forms. Abigail’s muse for these elements is no distant or generic landscape, but rather the surroundings of her home and studio in Devon–a county in England that is home to beaches, rugged cliffs, moorland and national parks. A peice from The Mineral Collection of materials, surfaces and 3D forms, by Abigail Jennifer. “Biomimicry has always been in my sight from a very young age. I was brought up surrounded by our beautiful English countryside, and while living rurally I became fixated on the natural ecosystems that surrounded me” she says. What fueled her translation of these Biomimetic forms into textile, and surfaces then? “My passion for Textiles originates from my mother, who is a trained Jacquard weaver and designer in her own right. She has been a huge influence on my creative direction and has always encouraged me to express my creative talent. With this in mind, my movement from studying Textiles and Surface design at University, to starting my own experimental surface-design practice centered around Biomimicry, was a seamless transition for me” Abigail says. 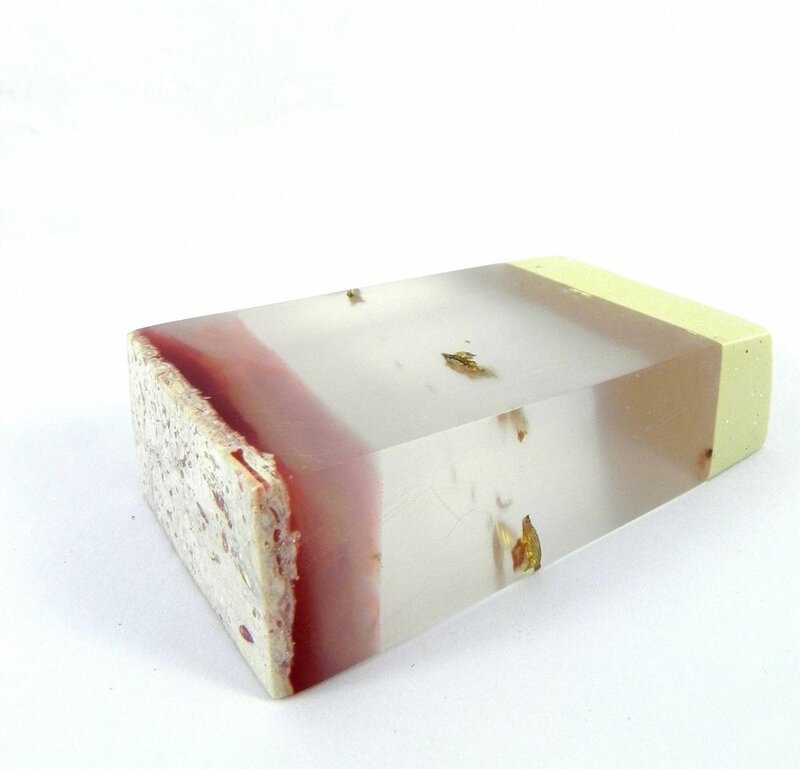 Having set-up such a practice, Abigail’s work has led her to create new composites of pigments and resin, and along with other less-familiar materials, to create a variety of biomimetic surfaces. While designers and design houses often endeavor to create realistic materials and forms that can be mistaken for being nature-made, that is not the case here. Abigail's materials and surfaces are an enhanced, more colorful, more abstract version of her natural case-studies. Her materials boast of both imperfection in form and pattern, as well as mathematical precision and finishing–a strategic duality which again links her work to nature. A piece from The Mineral Collection of materials, surfaces and 3D forms, by Abigail Jennifer. This perfect imperfection is the result of almost scientific exploration on her part, combining different materials and their properties together. “Where there is Science, there are equations or Mathematics. Mathematics plays a large part in my processing of The Mineral Collection. The ‘Mathematically finished’ property of ‘The Mineral Collection’ also creates the literal appearance of the shapes themselves–designed strategically from smooth or sharp calculated edges to fluid, semi-solid culminations of surfaces. Where then, do these manufactured, and yet naturally-inspired composite materials and forms belong? What is their perceived functionality? On the one hand, human-made and sustainably designed materials such as those created in The Mineral Collection have the opportunity to substitute more scarce natural resources being exploited in the market today, while still possessing a necessary Biomimetic charm. On the other hand, like all evolving composites, Abigail’s materials can take many forms, and adapt to many applications, accommodating far more uses that their natural counterparts. “I believe that as influential designers and artists it is within our remit to think about how we can develop the creative world in a sustainable fashion, whether this is using ‘in the market’ materials or inventing material composites of our own” Abigail says. A piece from The Mineral Collection of materials, surfaces and 3D forms, by Abigail Jennifer is set against the Devon landscape. She also feels that “Biomimicry is essential for the future, and we have only scratched the surface of what we can learn from nature. It is vital that we continue to learn from our natural surroundings and beyond, in order to utilize our potential on the planet." Abigail's materials and series of 3D forms have the ability to act as beautiful stand alone art, serve as hard surfaces for interior and exterior applications, and most recently have entered the realm of fashion and apparel. She is currently working with sustainable handbag designers Luxtra London to create 3D elements as part of their handbag design–“It’s a very interesting project and very much in keeping with the origin of The Mineral Collection” she says. For continue to learn more about Abigail's work, click here.